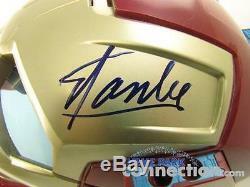 Marvel Legend STAN LEE SIGNED. STAN LEE & ROBERT DOWNEY JR. 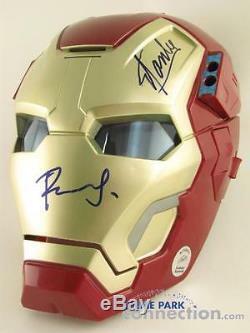 SIGNED Marvel IRON MAN Original Autograph Mask Prop. Theme Park Connection is your premier source for unique Disney Collectibles, rare Movie Memorabilia, and more! 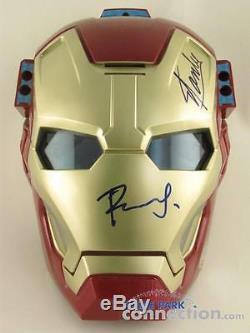 This is a retired Hasbro Iron Man 3 Arc FX Mission Mask that has been SIGNED by Marvel Comics Legend Stan Lee AND Iron Man and Avengers film series star Robert Downey Jr.
Stan Lee & Robert Downey Jr. 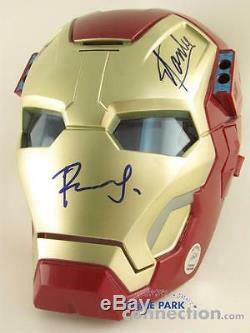 This Mask is Hand Signed by Marvel Comics Legend Stan Lee and. 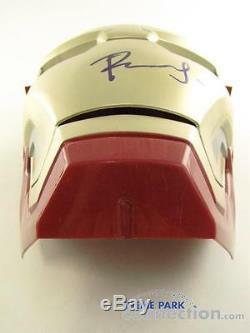 Iron Man and Avengers film series star Robert Downey Jr. 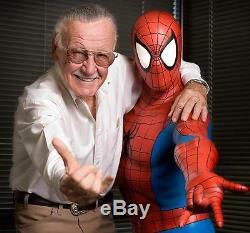 The mask includes an affixed "Authentic Stan Lee Excelsior Approved" holographic authenticity sticker which was applied to the mask by Mr.
Lee's people at the time of signing. 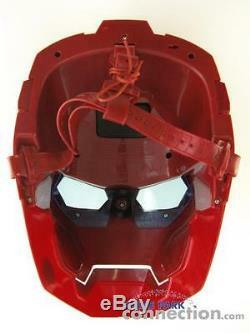 Retired Iron Man Mask Replica. Released in 2012 just ahead of the release of Marvel's highly anticipated follow up to. 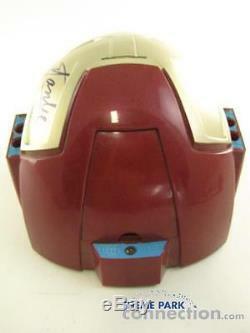 Blue LED Lights in the eye windows and Red LED Light on top light up when mask is activated. The light up effect is accompanied by a "missile fire" sound effect. Durable Hard Plastic with adjustable straps for comfortable sizing. 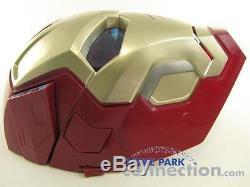 Item: Iron Man 3 Arc FX Mission Mask. 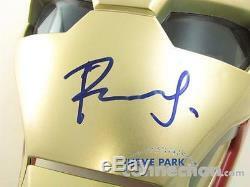 Autographs: Hand Signed by Marvel Comics Legend Stan Lee & Film Series Star Robert Downey Jr. COA: Includes Theme Park Connection Certificate of Authenticity guaranteeing the authenticity of the autographs; also includes an affixed. 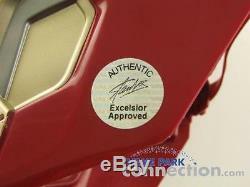 "Authentic Stan Lee Excelsior Approved" holographic authenticity sticker which was applied to the mask by Mr.
Dimensions: Approximately 11.5" by 7.5" by 5.5. Condition: Mask is in Good condition, as pictured; some general wear some scratches, etc. Our Warehouse is open to the public & all items can be picked up or viewed at 2160 Premier Row, Orlando, FL 32809. Extra care is taken to insure your items arrive safely. Theme Park Connection wants to help you understand that when we list condition it is very subjective & can be viewed differently from person to person. We do our best to describe an item's condition in our own opinion but it may not match your standards. The condition of the box it comes in could vary, we do not rate the box. You must be the final judge of how you feel the product condition is based on the pictures since the process is not an exact science. We will handle every issue & provide you with the best customer service. We understand things can happen but we assure you it is never on purpose so please give us a chance to fix any issue because we will. We will make sure the end result is positive by going above and beyond for you. Theme Park Connection is open to the public at 2160 Premier Row, Orlando, FL 32809. Show off your items with Auctiva's Listing Templates. The item "STAN LEE & ROBERT DOWNEY JR. 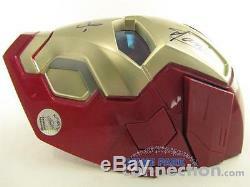 SIGNED Marvel IRON MAN Original Autograph Mask Prop" is in sale since Wednesday, September 07, 2016. This item is in the category "Entertainment Memorabilia\Autographs-Original\Movies\Other Orig. The seller is "themeparkconnection" and is located in Orlando, Florida.